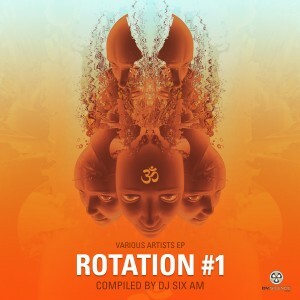 The various artists „Rotation #1 EP“ compiled by Dj Six AM contains 3 tracks produced by 5 artists. On the one hand you’ll get the original version of „Flowjob – Flow in the dark“ as well as „Flowjob’s – Alice in Orbit“ remixed by „Dream Architect aka Estefano Haze & Multiphase better known as Dj pr0fane“. Track No.3 „Family of Light“ is a collaboration of „ Hellquist“ from Sweden and „EliXza“ from Brasil. In opposite to the name this track sounds more dark with techno influences. Under the line the V.A. Rotation EP including tracks for open minded people who like different styles of psychedelic trance music. All tracks mastered by Chris Zippel at Chill Out Studios in Berlin. Posted in All Releases, Music, New Releases.Tagged EliXza, Estefano Haze, Flowjob, Multiphase, Music, Release, Rotation, Six AM.